Vaccines are among the greatest medical discoveries. Their popularity has significantly reduced and in many cases eliminated deadly diseases to humans and animals, increasing their life expectancy. There are several vaccination schemes for dogs and cats. Usually the first vaccination is given at the age of 2 months, followed by two others (one for cats) per month. – Parvoenteritis. It is caused by a virus that causes severe haemorrhagic gastroenteritis. It is common in unvaccinated puppies and potentially lethal. Carre’s Disease. Also known as canine distemper, this disease caused by a virus and causes fatal encephalitis, gastroenteritis and respiratory disease. – Hepatitis. It is caused by an adenovirus and leads to severe, potentially fatal, liver failure. – Leptospirosis. A bacterial condition that leads to severe liver and kidney failure. – Rabies. A viral condition that causes fatal encephalitis. Rhinotracheitis. It is caused by a virus which together with the feline calicivirus (FCV) cause the cat respiratory syndrome. Calicivirus Infection. It is caused by a virus which together with the feline herpes virus (FHV-1) cause the cat respiratory syndrome. Chlamydiosis. Causes conjunctivitis and occasionally respiratory disease. Panleukopenia. A viral condition that causes fatal gastroenteritis. 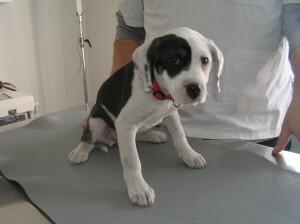 For a vaccination to be effective, the young animal must be in good health and have a good body weight. A visit to the vet 10 days before the first vaccination allows to assess the state of the animal’s health and to prepare for the vaccination.